What Gospel has an account of the vine and the branches? WHY more earthquakes are coming - and WHERE! What causes them! WHAT is prophesied about future earthquakes! SOMETHTNG BIG and ominous is building up deep within the earth. 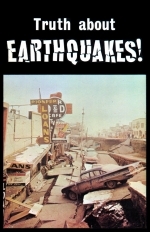 The sudden increase in earth tremors - both in frequency and magnitude - has become a point of growing concern. Dr. Perry Byerly, former professor of seismology at the University of California, recently stated, "Something worldwide is going on, but it is hard to say just what it is... we don't know what. But great forces are at work in relative patterns, trying to pull our continents in one direction or another. This is due to something below, a great STRAIN that is accumulating...."